Cool! the pictures are perfect. Maybe just please take a few close-ups so I can see some more titles (I’ve seen Mogwai, Tortoise, Modest Mouse… I didn’t expect!). Haha! 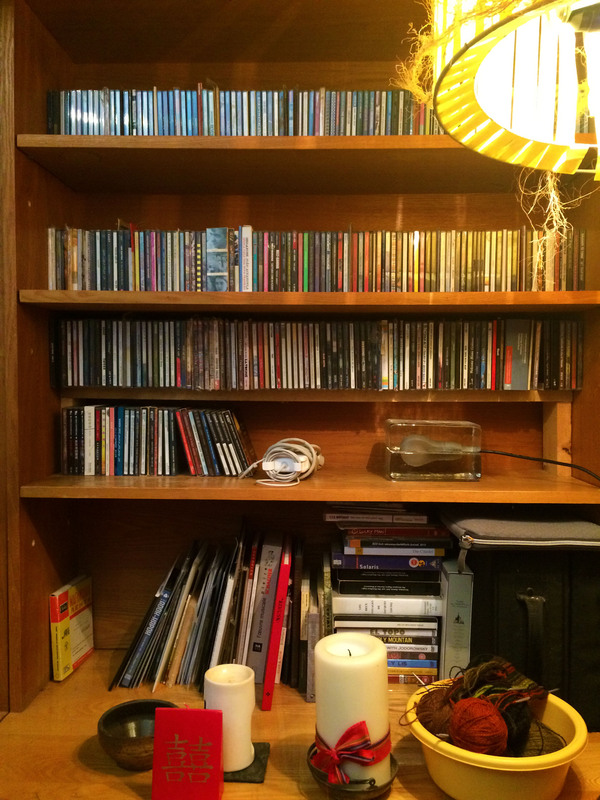 You can only read the titles on the ‘pop music’ shelf, because that’s where the lamp is. I’ll try to get close-ups of some other things. Haha! Ok, now I see also the non-pop stuff… Diamanda Galas, Current 93, Illusion of Safety, or Controlled Bleeding’s “The Drowning”, actually the album that, along with “Leichenschrei” of SPK has been the door to experimental (and industrial/noise) music for me. What was yours? I mean, now you’re know for your passion for field recordings, but what brought you there? “The Drowning” was definitely one of them, but before that my listening led me through indie and punk into industrial (Skinny Puppy, Neubauten, etc) and then on into more and more experimental sounds. The turning point was probably a mix tape I got my hands on around 1993 that introduced me to Zoviet*France, Brume, Current 93, Controlled Bleeding, and a bunch of others. and I remember I first heard Illusion of Safety on my hometown college radio station, WZBC in Boston (it was a track from “Water Seeks Its Own Level”). Zoviet*France’s back catalogue was really my bible in those early-exploration days. I see a lot of other interesting objects… can you tell me about what seems to be a sort of microphone in aspic? That’s a lamp. It’s just not on. the ‘microphone’ shape is supposed to be a lightbulb shape. Actually, there are a lot less objects on the shelves than there would have been if I’d taken these photos a week earlier. 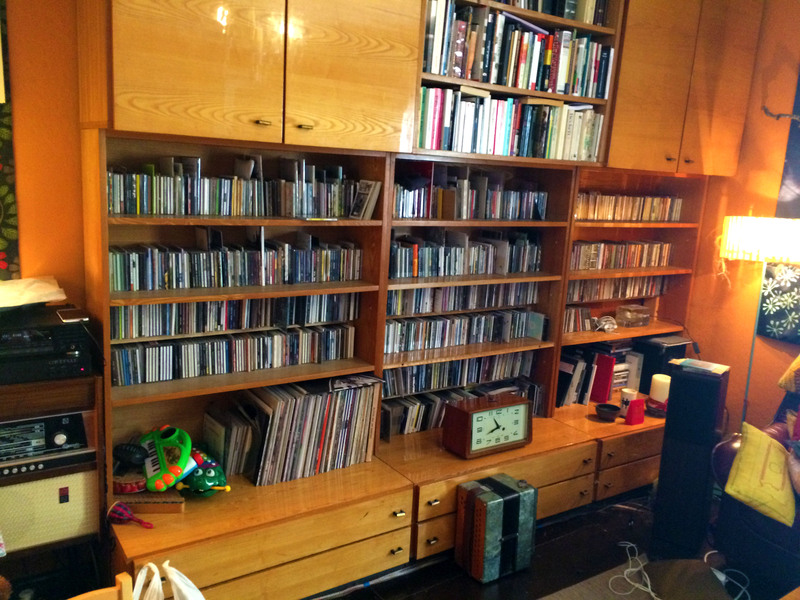 The shelves, in front of the CDs, used to be full of stuff, stones mostly, and other pleasing small objects. 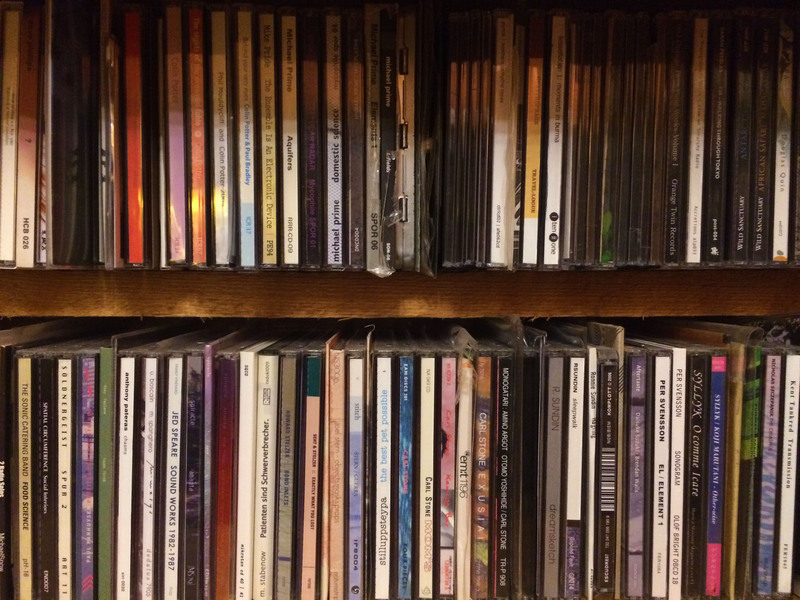 It made the CDs a little difficult to get at, but to be perfectly honest, most of them haven’t been played in years. 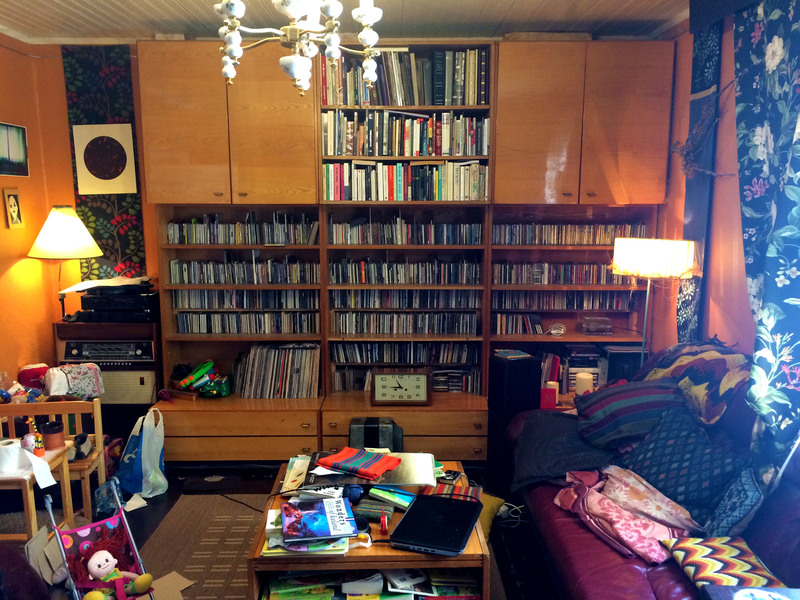 We listen to a lot of radio at home – Resonance FM, KFJC, WZBC, and BBC news – and the music collection is a bit neglected. I listen to so much for the radio show, I often can’t be bothered to choose something to listen to in the living room. 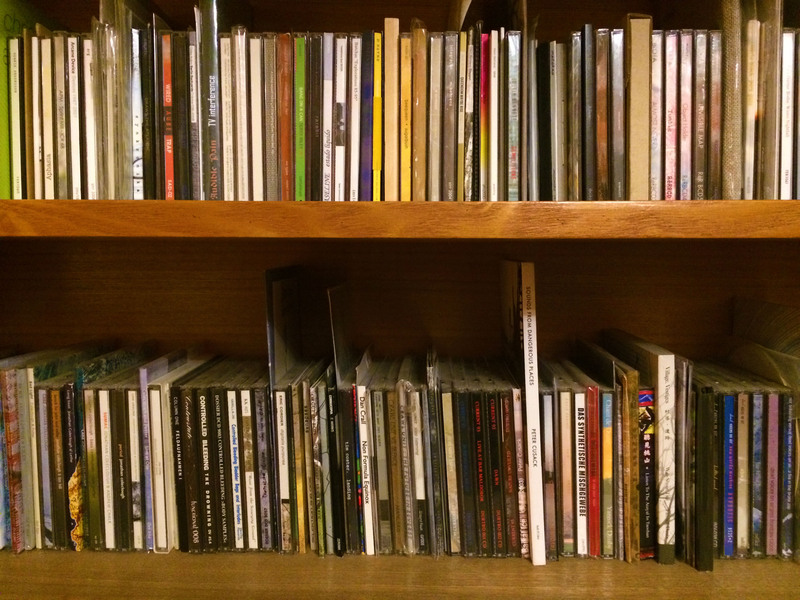 Also, since most people have stopped sending physical media to radio shows (and I don’t buy much), the collection is something of a snapshot in time. It grew to those proportions between 2000 and around 2010, since then if hasn’t changed much. Finally, with a 2-year-old in the house, it became necessary to pack away the piles of swallowable small objects. 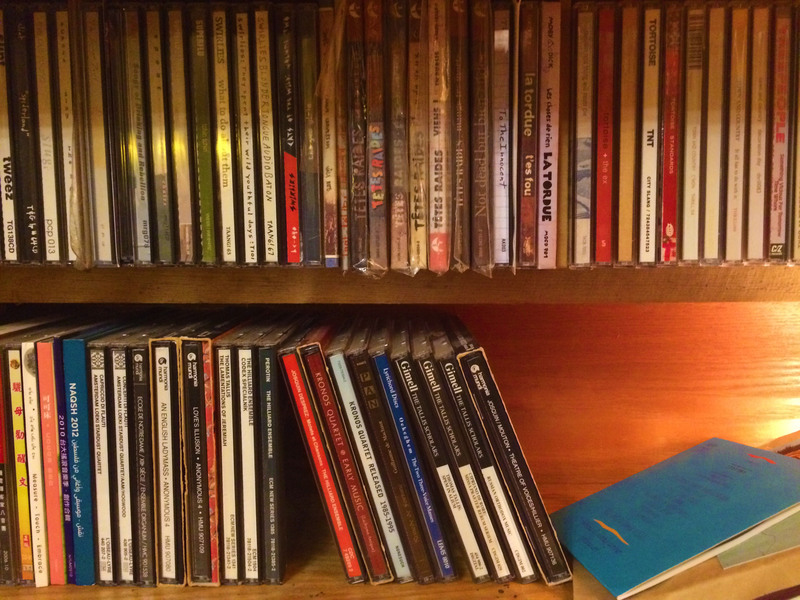 And the result has been that we’re listening to CDs again, which is a nice silver lining. Yes. I couldn’t also avoid noticing toys, mostly sound toys, that at a first sight I figured out are for musical performances… but the doll told me that most probably there’s a little girl in that house. How does she like (or not) daddy’s music, field recordings in particular? My biggest daughter (4 years old) seems so far be interested more into beats (any obsessive beats, from Killing Joke to EN…). Hm, I’m interested in the fact that you presume it’s a daughter! Most of what I can see in the photos is pretty gender-neutral. I had dolls as a little boy, didn’t you? But yes, you’re right, I have a daughter. And the sound toys are hers (well, and mine). Not a pile for the next Murmer performance or release, but a pile for our evening noise making sessions. She doesn’t presently seem to either love or be bothered by strange sounds. As a baby she could sit and listen to experimental or droney works and become pretty enthralled – now sometimes she might ask what it is, but there’s only one CD in the house that she actively requests, and it’s a CD of Estonian folk songs for children (that her daddy plays spoons on as well, so he doesn’t complain). It’s lovely what you say about your daughter (by the way: I didn’t have any doll as a baby, but you’re right, it does not mean that is for girls only!). Now I see what I might call the ‘field recordings’ section of your records, including stuff from the good old Alluvial Recordings, that – as far as I know – has ended its activities on 2009… Trying to avoid any nostalgic discussion in remembering of the old times, do you think that field recording-based music sounds now ‘old’ to most of the listeners? I remember having a nice but serious discussion against Massimo Ricci on that, as he does not like the genre very much, he thinks that what field recordings may have to communicate it’s already told. Obviously, I didn’t agree (I can say the same of guitars somehow! ), but what’s your feeling about? I think your mentioning of guitars is very apt – no one would ever say we should stop using guitars, they’ve had a good run of it, but they’ve communicated all they have to communicate. Why would they say that of the entirety of found sound recording? Which could be of anything, by the way: birds, machines, electromagnetic waves, water, wind, traffic, voices – a far more diverse palette of sound than a guitar. It’s not a gimmick, it’s an entire universe, waiting to be heard. So to answer your question more concretely: no, I don’t think field recording-based music sounds ‘old’, any more than guitar-based music sounds ‘old’. Some old guitar-based music might sound old, but new guitar-based music might not. why would it be any different? By the way, I’m including a batch of pictures that i took for you several months ago, but I thought they were awful, so I didn’t bother sending them. But I’m sending them now so you can see what the shelves looked like before they had the clean up I mentioned earlier. Haha! Those photos are horrible, but it’s great to see them! It gives me the impression that you have cleaned and straighten up the whole room in order to show it to me, like when my wife knows that some guest is coming and forces me to clean the house (and I don’t). Which actually is pretty in line with the spirit of Concrete Shelves… so you virtually invited me to take a look in your house as a guest. Ah! Ah! Well, not exactly. Mostly the stuff got cleared off the shelves because the 2-year-old got tall enough to grab it, and most of it is perfect swallowing/choking size. So small knick-knack decorations, of which I have many, have been banished from the living room for the next few years. And it was the cleaning/organising of those shelves that gave me the impetus to finally take those pictures for you. So it wasn’t that I cleaned for your ‘visit’, it was that cleaning *brought about* your ‘visit’. Anyway, I obviously fully agree with you on what you say about field recordings. One of the things I like in field recordings is the fact that they can always add some alea, some chance occurrence, a random element in a musical composition. They add movement. So I will not ask you about your field recording favourite albums of all the time, that will make no sense now (but some curiosity in me is still alive ;-), but what field recording sound in an album has really made you jump on the chair or made your eyes pop? Patrick Tubin McGinley is an American-born sound, performance, film and radio artist who works with field recording in both documentary and abstracted form. He focuses on small discoveries and concentrated attention, and works equally with spaces, objects, resonances and people in composition, performance, or simply collective action and experience, in exploration of perception via attentive listening. He has released many albums of compositional work under the moniker Murmer, has directed, recorded or designed sound for a number of films, and has produced Framework Radio, a program for the field recording community, for over 15 years.